I set up my old 240 (well over 30 years old) that had been dry for years. I noticed 2 months later now that the lower right corner seem has turned white for about 6". The Aquarium- A Tru-vu has survived Earthquakes and bad leveling before over the decades...moved and dried for long stretches too. Since its full of (80 pounds of pool sand) sands ,fish, water plants. Is there anyway to inject a glue into a seem underwater..that still has no gap? Is there any miracle cure? Its survived a lot. I did put even more bracing under that corner..hoping to remove anymore stress. What are the odds..it just stays the same another decade or so? AS long as I'm asking..if it ever leaks? is it possible for average guy me to fix it - by then dry of course. I only thank god I used and had all the hardware to start. I only have bought about $150 worth of fish and plants. From the gitgo I wanted a budget big freshwater setup. So, If it should give out..I still don't want to give up on the thing. BUT! !,right now, any IN TANK repairs that would help? Asking a lot..but something must have been invented for non toxic in tanks glues!.. I hope! Thanks for the reality check.. All I can do is see if its stopped in its tracks with more bracing. Somebody else said that fixing a de-seamed Acrylic is easier then glass...you don't remove the Acrylic panes. you just fill in the gap and by the next day you COULD fill it with water. I hope! I appreciate your help, believe me! One more question, I have to ask- Would it help top apply weld 40 or even super glue to the outside seems length? Stop it in its tracks? Prevent further travel?.. I found a months ago photo of that tank-and it was already liked that. After 35 years, I stopped noticing things I guess. I’ve been reading your forum on Acrylic seams, cracks, etc and wanted to ask Bob Fenner a question. I can’t see where to post a question and was wondering how to reach him? I just built my first aquarium, it’s 300 gallons and I have some concerns about the seams that I wanted to ask him. Can you advise where to ask? Hey Bob! So, like I said I just finished my first build, of a 300G acrylic for my home. It’s 1” acrylic on all sides and 1/2” on the top and bottom. It will be set on top of a solid wood stand with a 2” thick concrete countertop. Dimensions are 72x24x30. Everything was cut with CNC machine and all the pieces are square/plumb, etc. All my sides came together perfectly and my top went on perfectly... my only concerns are with the bottom piece. I did the bottom last, and with all the weight (even using the pins method) the weld-on #4 didn’t create solid clear joints like everywhere else. There were like 5-6 spots total around the whole base where it created pockets that sealed and I just couldn’t wick it in there. Doing this over, I think I would’ve used the 2-part epoxy, but overall the solvent did really well considering it’s 1” thick acrylic. So, all things considered I’m happy that the joint pockets happened on the bottom piece rather than the corners or the top (I think?) take a look at the attached pics and let me know your thoughts. Would a catastrophic failure be possible if only the bottom seams are like this, since it’s fully supported underneath? Like I said, 90% of the bottom piece is good, but there are several pockets that are there. Ps. After reading all the forums, I realize I could have added doweling if need be, but I already added a thick bead of #16 around all the bottom seams for extra support. I filled the tank twice and let it sit for a couple days and had no leaks, no movement, no cracks or hazing, etc. Is there reason for concern after seeing the pics of the bottom joints? If there were to be a failure, what do you think the signs would be if this is only the bottom piece? Is the bottom piece the least stressed since it’s got full concrete support underneath? How would I place the doweling (if needed) if I already put a thick bead of #16 around all the inside bottom joints? These are the best I can get. So this tank is ok to use as my main tank? 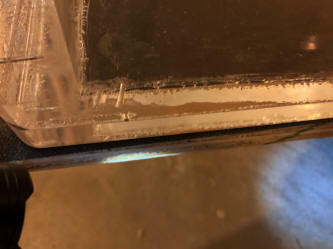 Also if we're get some weld on 4 how would I get it into the cracks since they are not open to the tank inside or out? Thank You all for the FAQs on acrylic aquarium repair. I had outlined some of the crescents in marker when I set up the tank in Dec 2015, and noticed yesterday that many had grown considerably and are approaching the interior edge of the seam. 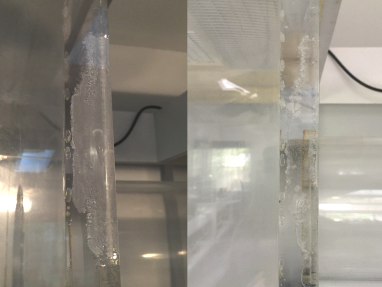 So I drained the tank about 60% and used a locally-available water-thin plastic solvent in the white areas of the seams (dripped in with a needle applicator) . 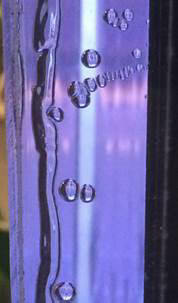 I could see the solvent quickly spread by capillary action, but the areas remained white. Oh By The Way...I live in Japan. So none of the labeling on the solvent that I used is in roman letters, so I cannot tell exactly what chemical it is. 1. Must the white areas turn clear to be fixed? 2. Have I maybe applied a barrier to the Weld-on 4 being able to make a bond? 3. 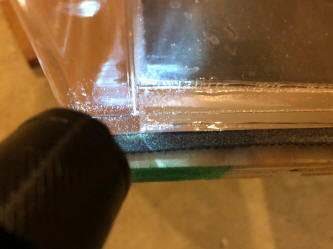 Is Plexiglas similar enough to tank acrylic to test adhesives? IE if it works or does not work on Plexiglas, will it work or not work on acrylic? 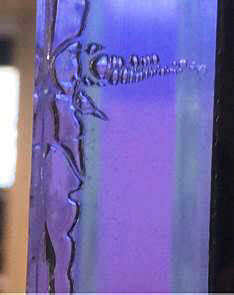 <The terms acrylic and Plexiglas (both PMMAs) are often used interchangeably. Solvents, tools, methods for one should work on the other. Oh yes, if/when I am ever obliged to move, I'll definitely have that square doweling installed in all the corners before setting up the tank again. I did draw down the water level to below where the 'white area' seam failures are occurring. By "most viscous" Weldon product, is there a specific one that you recommend? Is it also applied with the needle applicator? I would be very grateful if you could give me some advice. 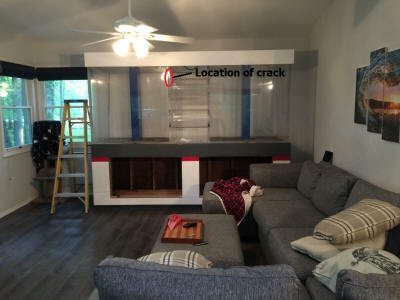 I recently acquired a 700 gallon acrylic aquarium. I thought it was a real steal for $500. 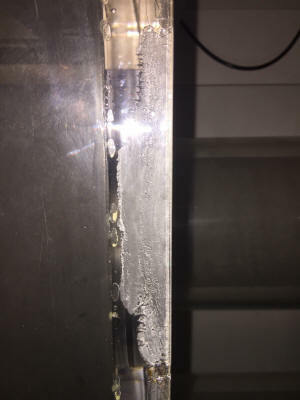 The aquarium has an area about 8 inches long at one of the seams that appears to have been damaged judging by the visible hazing in this location. 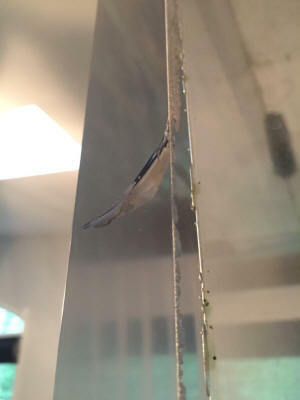 There are two visible cracks on either end of this area that may have occurred when moving the tank into my house (I'm not sure if they were there before, the hazy area was there before, but I had not noticed the cracks before the move). but I'd like to do anything possible to prevent that the cracks from growing and become a problem. What would be the best way to repair or mitigate this damage? My current plan is to try and repair the seam by injecting IPS-4 acrylic solvent into it using a syringe with a small gauge needle and applying light pressure with a bar clamp. I've also ordered some 3/4" acrylic right triangle rod to solvent weld into the interior corner to reinforce the entire seam from top to bottom. I'd be grateful for any advice you have as to these plans or any better course of action. One particular question I have is what would be the best method for welding the triangle rod reinforcement into the interior corner? Is there a particular type of solvent or method for applying it that you recommend since the piece has to go in vertical? Would capillary action work or would it be better to try and find a more viscous solvent that could be applied before putting the triangle rod in place? What would be a more viscous product that I could use? Would IPS-40 be appropriate here? Is there any other actions I could take to repair or reinforce the tank? Any advice you have would be very much appreciated! Very grateful for your reply and advice. I'll let you know how it goes. 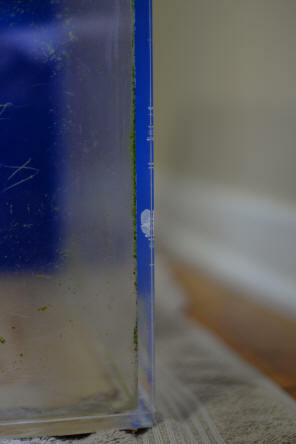 I’ve started repairing the damaged seam on my acrylic aquarium. I was able to inject solvent into the damaged area fairly successfully using a 31 gauge insulin needle (see attached picture). The white hazy area where the seam was coming apart has now been reduced by 80-90%. I had also ordered some triangular acrylic rod for doweling the interior corner. When the material arrived, I believe due to it being extruded, the sides were not perfectly flat and it did not fit tightly into the corner. I tried machining the sides flat using a router table. I used some of it on one of the back corners of the tank (that won’t be very visible) as a test. I was able to get decent adhesion, but not perfect and certainly not a totally clear weld. Would this likely have come from an imperfect fit? You recommended using square rod for the reinforcement. Can you recommend a good supplier with rod that is good and flat on the sides? Also, I was wondering if painter’s tape can be used to protect the nearby areas from solvent drips? Hello there and thanks for providing such an informative website! I purchased a used acrylic tank whose condition is a bit rough, it’s 150 gallons 72”x24”x20” 3/8ths thick sheet pretty standard stuff. Anyhow I could really use an expert opinion on whether this tank will require dowelling after I re-solvent the separated chemical welds. If so must I use cast acrylic or can an extruded rod be utilized for the dowelling? 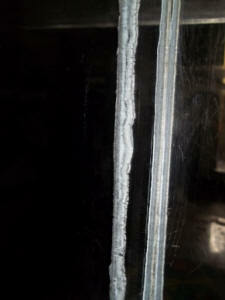 Furthermore when do you recommend using weld-on 3 versus weld-on 4 for re-solventing? Hi Bob thanks for getting back to me so fast, in your response about dowelling the corners you mentioned the near by crazing worried you how so? With the additional dowelling should I worry about the crazing? Got it, I will weld up a steel stand with a 1 ½ butcher block top to support the tank properly; dowel all internal corners, and re-solvent the bad seams. Thanks for the sound advice! Hi, I am rather humbled to ask, but what is the "lifespan" of acrylic aquariums for both larger and smaller models? I ask because I have been in the tank maintenance business for 25+ years, and some of my clients tanks are that old or older. Also, if an acrylic tank starts to get the "cloudy spots" in the seams, or any other tiny leak, will those seam leaks grow? So I purchased a 140 gallon Acrylic aquarium off crag list for $400. The dimensions are 60x18x30, my question is should I worry about these I don't know what to call it other than anomalies in the panes which I guess is called a joint. 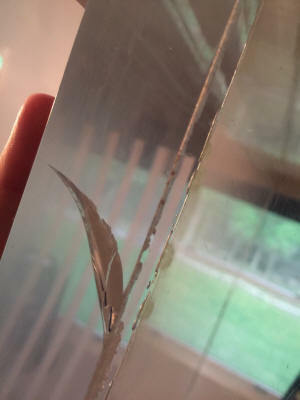 I have never had an Acrylic aquarium so I have no idea but I'm worried after a little research on how to remove scratches lead to reading about catastrophic failure . <The bit of hazing, scratching is not problematical; and the blem in the joint looks fine from the one pic you sent. Does the "whited out" area extend far into the joint? (when seen from the direct on view?). If more than a quarter way through, ahead of filling I would fill w/ a low viscosity Weld-On product as gone over on WWM. Otherwise I'd use this tank as is. Ok, thanks again for you input it's much appreciated . The whited out area you speak of do you mean like a blotch spot? , the guy I bought it from said the blotches are just cosmetic but I have my doubts. My only concern is the tank being safe to setup in my living room and not worry about walking in a small pond one day. I provided one more picture of the right side of tank. Got it went over it very helpful. 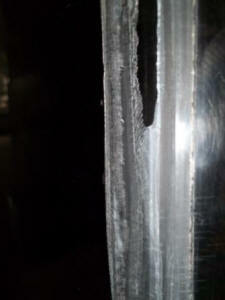 To get a better idea of how this happen , I'm guessing the blem is a result of the outer seam not bonding or unbonding ? If I use the tank as is, in your opinion will it be fine until I save enough money to buy a new one with the same dimensions ? About maybe six months to a year? Hi guys! Thanks for the website and the info--due to some (possibly overly paranoid) worry I have, I wanted to send you an e-mail about a tank I just got. Picked the tank up from someone who was looking to get out of fishkeeping, he had it for several years and never had any issues with leaks and despite being on a stand that I don't think was the best (large gap in the middle so it wasn't supporting the entire bottom of the tank, which we would be reinforcing), there wasn't any bowing going on. I think the brand was SeaClear, unfortunately only 3/8" thick which seems to be pretty standard for these mass produced tanks, and there is some noticeable crazing with a few spots that made me a little uneasy. I'm not super familiar with acrylic tanks, but I wanted to send some photos of the spots I mentioned to see if I'm just being paranoid or if there is serious cause for concern. For as long as he had the tank, there were no issues, no leaks, bowing, or anything like that and he kept an Oscar, a Parrot, a Firefin, two Plecos, a number of pretty decent sized rocks/ornaments and a lot of substrate for several years without any issues. Am I getting worried over nothing? Yeah, the impression I was getting from your site and others was that using the two products you mentioned would help fix the problem, with the latter applying to tanks that looked worse than ours. If we just use the Weld-On 3, how long do you think could we reasonably expect the tank to last without fear of leaks/bursting? Is the solvent anything we could buy locally, or is our best bet to order online? Hi, I have a standard 180 gallon marine aquarium, 6 x 2 x 2. Acrylic is 1/2 inch thick with heavy Eurobracing. The tank has been running for one year. I noted some crazing on my tank mostly on the right seem towards the top. See picture. I bought it off CL. It was 6 years old but never setup by the owner, so no info on manufacture etc. Thank you for the prompt reply. It really helps. I wanted to ask you guys a couple questions. I have a 1200 gallon 1 1/2" acrylic tank. The seems look ok with some crazing. I have included a pic at the top of the front panel. It is about 1/2" wide so it is still leaving about an inch of bonded space. Should I reinforce this or is this ok if the rest of the tank is normal? The tank dimensions are 10'x4'x4'. My last question is I talked to an engineer and my tank is level side to side but from front to back (4' side) it is almost a 1/2" unlevel. He said this was about an extra 100lbs on that panel but should be fairly insignificant to the rest of the tank. He said it should be fine. Do you agree with this? Thanks. Thanks for the responses. I probably phrased the question wrong. The tank is all the same size, just my floor has a slight decline causing the tank to lean slightly. is slightly going down hill, the water level is about 1/2" higher in the front of the tank than the back. So over 4' it has a 1/2" decline. Is this a problem or was the engineer correct in saying the panel will hold about 100lbs of water extra and shouldn't be a big concern? We just has a 150 gal custom acrylic tank fabricated for us. The one side seam has bubbles trapped in the entire length of the seam, pictured below. 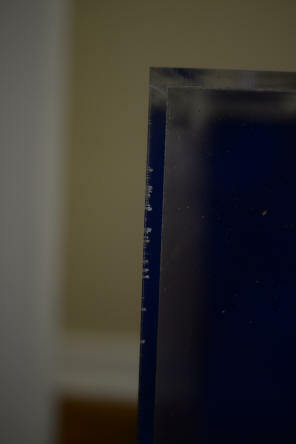 The acrylic material is ¾" so I don't think this is a structural or leak issue but one of cosmetics. Is this typical of acrylic tanks or unacceptable? The tank cost upwards of $4k. Thanks you in advance for your opinion. The tank is free standing in the middle of a room. There is some millwork under and above but out in the open. So your telling me this is acceptable and I should pay for the tank? Thank you for your help. The tank fabricator is stepping up to the plate. He is sending a rep up to correct the problem. I'm sure this question is answered somewhere on your site but it has defeated my attempts to find it. I have a built in overflow that has a small leak at the bottom. The leak is between the overflow and the tank so no water gets on the floor as long as the power stays on. But since the leak causes the overflow to equalize with the tank any power outage will drain the tank about 6 inches, which is more than my sump can handle. 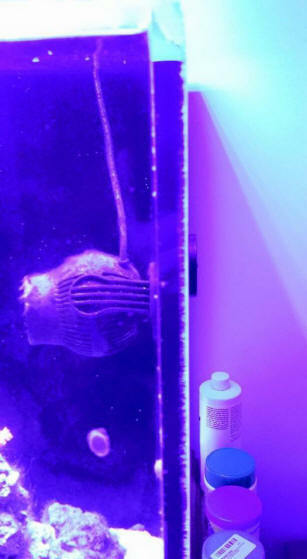 I currently have the pump off, and closed the return valves so this can not happen but I would like to get my tank connected to the sump again. Is there a way I can seal this leak without draining the tank? Both the tank and the overflow are acrylic. The overflow is in the middle if the back wall and goes from the base of the tank up, with the holes in the bottom. The leak is somewhere along the bottom edge where the overflow meets the base but I do not know exactly where. First, thanks for all the useful information your site provides. 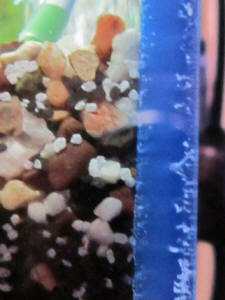 I have read the information currently on the site for acrylic tank crazing/cracking issues. I have a 64"l x 15"w x 24"h Clear for Life tank which has 3/8" acrylic. Bought it used so I do not know it's age. It had only very few minor scratches, no cracks, but some crazing in the seams. I have never had a take this large or an acrylic one. Tested for water tightness before setting it up and no problems - minimal bowing when filled. Top brace looks good. I have set the tank up and the crazing in the seams is concerning me. There was some in the bottom seams, but very little. My real concern are the side (vertical) seams along the colored rear acrylic piece. I have enclosed two pictures of the most affected seam. I have had the tank set up a couple of months, and although the crazing does not appear to be growing, but either I did not notice the cloudy fading horizontal bands layered up the seam (blue to lighter cloudy blue), or it now has those cloudy bands. I really need someone else's opinion of whether this is minor or could cause a failure soon. The hood that is one the tank is very heavy and I am wondering if this could be an issue? have a wooden/particle board stand and hood to match. Thanks - didn't notice my typos until I read this back - sorry. Hi, we recently bought a large (300+ gallon) acrylic 1 inch thick aquarium with center back overflow and nice steel stand. It has a black acrylic back, is a nice deep shape, is 30" tall and was not super cheap and is a hard to find shape (would not feel happy throwing it away or putting a free sign on it). I just noticed that some of the seams are not clear. Many are but quite a few are not. The previous craigslist owner said it did not leak at all. We have not filled it with water yet because I wanted your feedback first. We looked for pictures that looked like ours with what to do but did not find much, so am sending the email. I'm attaching pics for your feedback. And if repair is needed where is good in southern California (we are not capable ourselves) and is it worth it? And your website it a great service, we've used it before for research. I have recently purchased a 300 gallon acrylic aquarium from c-list for a couple bucks and thought I was getting a real deal. and I may have if I don't count for my labor resurfacing the tank. My question is and it's a three part'er; how would one go about contacting the aquarium manufacturer being Clarity Plus (SeaClear, the Casco Group and so on) to attempt to cash in on said warranty? I cannot find any contact info for them anywhere. Wondering if maybe they shut their doors? Assuming I am not lucky enough to cash in on that warranty and continue doing the work myself, how clear is clear enough for acrylic? I have dry sanded from 120grit up to 400grit and then wet sanded from 400-4000grit and come back with polishing compound and have gotten it very clear. However there still appears to be distortion from a few feet away. I can place a book inside and still read it but can't read it looking through both panels (just a test for clarity no intentions of reading underwater). or because the tank has some age and permanent-bowing to it? Am I worrying to much and water will fix it? 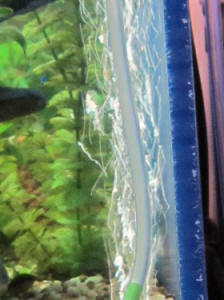 The seams of the tank in various places around the tank have turned whitish in some spots. Almost like there is frost or ice between the panels. None are very large maybe 2' at the most , but they do span the whole 1/2' of acrylic. Never owning an acrylic tank I don't know the risks involved. It would be my assumption that the chemical bond broke there just isn't leaking (have done a 2 week leak test with litmus paper on the seams to verify leaks). Do these need to be shored up with the square braces as suggested in other posts or can I take a needle with solvent and forces it in the joint? Or something along those line? Any and all answers and suggestion will be greatly appreciated. hi, huge fan of this web site, essential reading for fish keepers. Think I've got a problem i need advice on, just purchased an acrylic tank 48"Lx18"wx26"h. its made with cell cast 12mm acrylic. On inspection i noticed lots of small 1/2mm bubbles on seam. there mainly on external edges but not just a couple. I've spoken to the producer and he's said its normal and wont effect strength much but I'm concerned about filling it and will the life expectancy be reduced? or am i better off leaving be so i can keep an eye for whitening or crazing on these bubbles. thanks again. I am finally getting around to setting up my 180g Clarity Plus aquarium. I have had the tank full for the past week doing a "leak test" prior to putting in my living room without any signs of leaks. I inspected the seams, and I think they look ok and fairly clear however on the vertical front seams (where the front & side panels join) there are some cloudy / bubble like imperfections, almost looks like frost on a windshield? The spots don't run across the width of the seam itself, and there was no evidence of a "whiteout" cloudy area across the entire seam. The imperfections are more prevalent on the outside edge of the seam, but is difficult to tell how far the extend across the seam - perhaps 1/2 way in 2 small spots but in most spots they look to < 1/4 of the way across the seam. I didn't notice the spots getting worse over the week the tank was filled. I tried to take a photo, but given the way the front panel is rounded off as it meets the corner it was difficult to get a good picture. Obviously with a 180g tank the last thing I want is a leak in my living room, from your experience working with acrylic is this normal and what is the risk of separation that would cause a leak? think I should have the inside seams of the tank reinforced with 1/2" acrylic square tube by a local plastics shop? I mistakenly added my phone number at the bottom of the last email I sent you, please delete if you decide to post it thank you! Hello; I have a 600 gal saltwater tank. One seam on a 1" X 1" acrylic 3' high corner has a cloudy look half way up. .The rest of the seam is still clear as well as all other corners. The tank is a 2 year old reef-fish with many critters so emptying it would, I'm afraid, kill some of my friends although I will if there is no other solution. but then to make it look uniform I would have to do the same to the other corners. The corners have a 3/4" radius so I don't think I could wrap around the corner and get a good weld. The tank is very odd shaped ( like looking down on an H with a tub in one end of the H and a shower on the other with the aquarium as the walls ) plus there are straps welded across the top tying each side of the H together. What I'm wondering is there a way to mend that seam without emptying the water or any other solution? 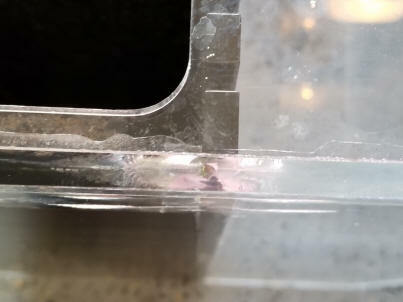 Does the #40 epoxy weld under water? the inside of box? 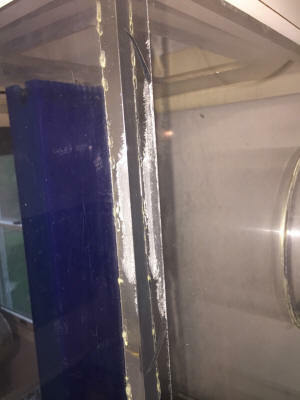 It doesn't leak to outside of aquarium just to inside of rear corner overflow. <You can try this... Silastic doesn't stick well to acrylic... but if it/this is only a pin-hole leak w/ little pressure... this fix might work. I have a problem or worry about a future problem. I bought a 135 gallon Clear For Life acrylic tank about 4 years ago. the typical 72x24x18 at 3/8" to cut cost tank. It was setup fresh for a few years and when I moved I never set it up. Well I decided to setup a ray/shark tank, until they outgrow it. When I got all of my other equipment together, I filled it, and after the system was running for a minute (literally a minute) the rear right seam blew and flooded my living room. I got about half of the water out into my yard instead of my carpet. 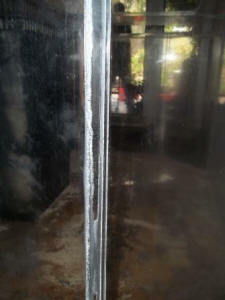 After contacting advanced aqua tanks they repaired that seam by adding a corner brace at the bottom and up the side. ultimate question is about using weld-on or a similar product to strengthen the seams before I set it up. I read one of the last questions, Re: Acrylic Tank Crack Repair/Drilling Acrylic -- 12/31/07, that someone recommended it that maybe it would apply to my situation as well. I don't want to do something that could weaken an already weak joint. Also, if you do recommend it, after it has cycled transfer my inhabitants of my other tank to and do the same to the Uniquarium. As I mentioned it is a lot worse off where the crazing goes completely to the interior of the back panel of the sump area. I have other questions about the sump setup and return of the 135 but until I read those articles I will leave them alone. Thanks for the direction! I contacted a local Plastics store and they carry Weld-On and will cut pieces to fit the interior dimensions to Weld-On to. No pun intended. In the corner where the overflow is, would I want to adhere the joints that are in direct contact with the water(the show side) or opposite? Would it be wise to do this to the bottom joints as well, while I am at it? for the shark and rays but until then, I'm stuck. Thanks for the direction! I contacted a local Plastics store and they carry Weld-On and will cut pieces to fit the interior dimensions to Weld-On to. No pun intended. In the corner where the overflow is, would I want to adhere the joints that are in direct contact with the water (the show side) or opposite? Would it be wise to do this to the bottom joints as well, while I am at it? In the end I want to jump to a 180 Hex for the shark and rays but until then, I'm stuck. 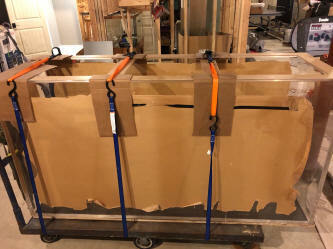 I recently purchased a 4ftx2ftx2ft Â½' thick acrylic aquarium. It was made by a local who claimed it was leak proof. Well I took it home and it leaks around the bottom in one of the corners and about 6-8' along one side bottom seam. I can also see a lot of little bubbles in the seams. As well he didn't square up the tank perfectly and one of the sides sits out 1/6' off the bottom sheet. I am wondering if I should try to use some Weldon 16 and go over all the seams or if I should just get rid of this and find another?? It is brand new but leaks!!! Hey Crew. I have an acrylic tank that is holding livestock that is leaking. I've been reading through the site and only see suggestions on sealing leaky tanks when they're dry. Is there a solution to seal an acrylic tank when it has water in it? Ok, thank you Bob. I really appreciate the knowledge and experience that WWM provides the aquatic community. It has benefited me greatly over the years.